Madhur Jaffrey is a TV food personality and cookbook writer who demystifies Indian cooking for English-speakers. On her programmes, she frequently dons the dress of the particular region of India featured in that episode. She came to cooking late in life. This enables her to know what people don’t know, and the small things that will need explaining. Consequently, many comment on how well-written and clear her recipes are. 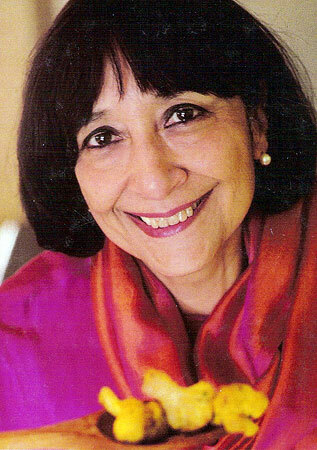 Madhur Jaffrey was born Madhur Bahadur on 13 August 1933 in Delhi, India. She had six brothers and sisters. She and her sister were sent to convent schools. Her family was very wealthy. Her grandfather had been a wealthy lawyer and built the large mansion they grew up in. Growing up, they had servants doing all the cooking and it wasn’t the done thing to even wander into the kitchen. To this day, her mother says she can’t believe Madhur went on to write cookbooks. Upon graduating from Delhi University, majoring in English literature, Madhur joined All India Radio, and acted in some stage plays. In 1952, at the age of nineteen, she moved to England to study acting at the Royal Academy of Dramatic Art (RADA) in London on scholarship. At this stage in her life, she couldn’t cook — she couldn’t even boil an egg. While in London, Madhur missed the cooking from home, and asked her mother to send her recipes, which she began making. Madhur continued pursuing her acting career, getting jobs in TV, film and radio productions. In the late 1950s, she moved to New York. There, she married Saeed Jaffrey, an Indian actor (born 8 January 1929 in Maler Kotla, India.) A Muslim, he was Director of Publicity and Advertising for the Government of India Tourism Office in New York (1958-1960.) She had actually known Saeed from back in India, where he had been her boyfriend previously. He, too, had worked for All India Radio as Radio Director (1951-1956.) But Madhur had got her acting scholarship in London, he had got his in New York. The couple would have three daughters: Meera Jaffrey, Zia Jaffrey, and Sakina Jaffrey. Madhur took on various part-time jobs. She worked as a part-time tour guide at the UN and at the Lincoln Centre, and taught pantomime. She also started writing food articles as a sideline to supplement their income. In 1965, she divorced her husband Saeed, and sent her three girls to India. In 1969, she married Sanford Allen, a violinist, and the first African-American player in the New York Philharmonic . She’d met him at the Lincoln Centre while tour guiding. In 2004, she was awarded Commander of the Order of the British Empire by the Queen. Jaggi, Maya. Madhur Jaffrey: A taste of history. London: The Independent. 21 October 2005. Roy, Amit. Eye on England: No hard feelings (Madhur Jaffrey). Calcutta, India. The Telegraph. Sunday, 19 March 2006. Roy, Amit. Eye on England: A trip down memory lane (Madhur Jaffrey). Calcutta, India. The Telegraph. Saturday, 10 September 2005. Nair, Anil. Pilgrimage of the palate. Mumbai, India: Daily News & Analysis. Saturday, December 03, 2005.